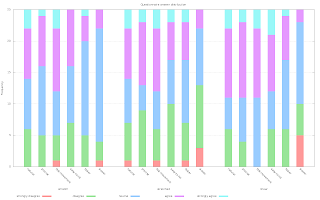 This post is a summary, the full writeup with data is here (PDF). The texts are quite similar, so if you plan to read the paper you can skip this post. 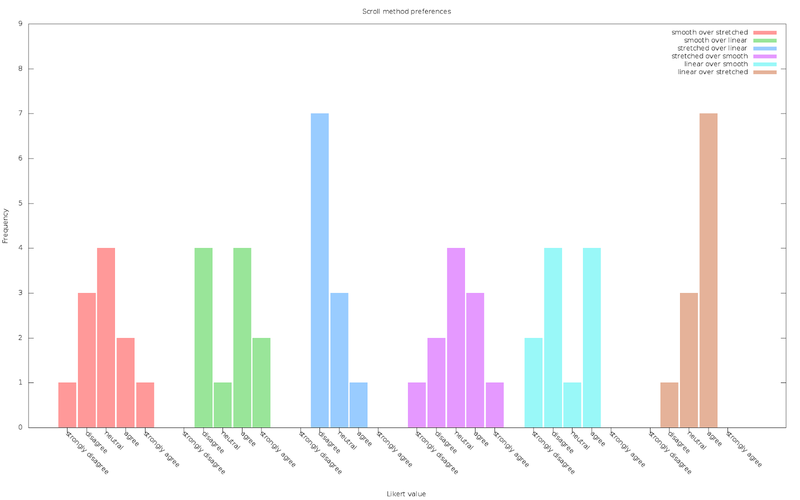 Following pointer acceleration in libinput - an analysis, we decided to run an actual userstudy to gather some data on how our acceleration behaves, and - more importantly - test if a modified acceleration method is better. 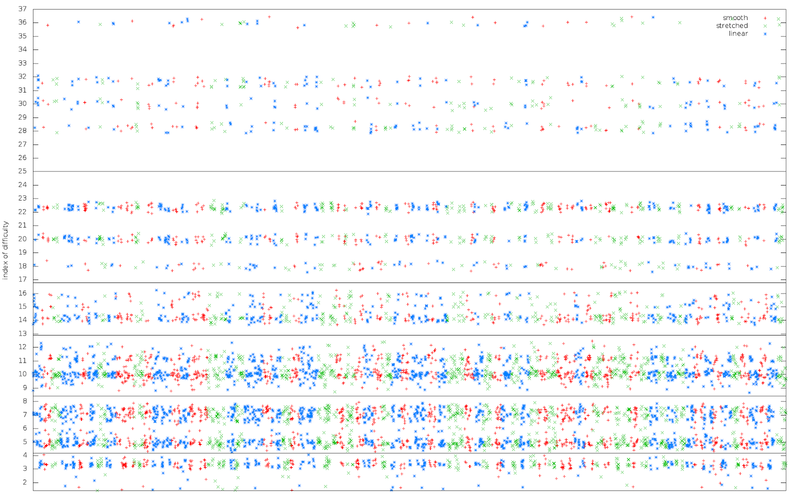 We developed two new pointer acceleration methods (plus the one already in libinput). As explained previously, the pointer acceleration method is a function mapping input speed of a device into cursor speed in pixels. The faster one moves the mouse, the further the cursor moves per "mickey" (a 1-device unit movement). In a simplest example, input deltas of 1 may result in a 1 pixel movement, input deltas of 10 may result in a 30 pixel movement. A shortening of "smooth and simple", this method is used in libinput 0.5 as well as in the X.Org stack since ~2008. 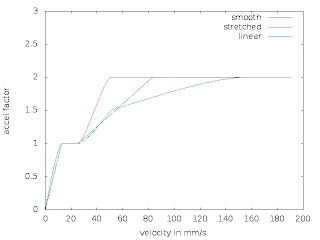 a modification of 'smooth' with roughly the same profile, but the maximum acceleration is applied at a higher speed. This method was developed by Hans de Goede and very promising in personal testing. 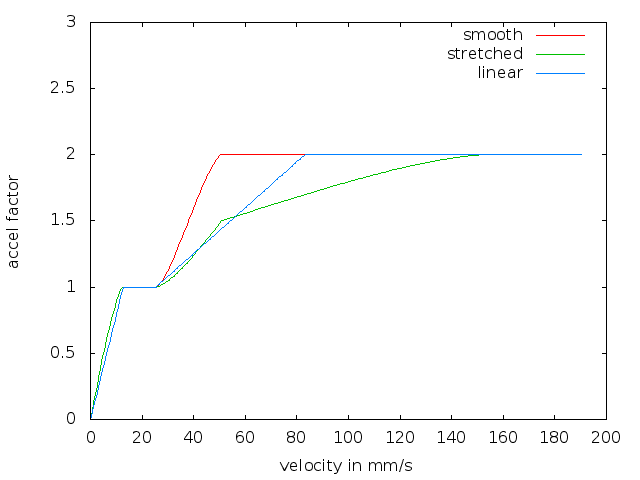 a linear acceleration method with a roughly similar speed-to-acceleration profile as the first two. This method was developed to test if a simple function could achieve similar results, as the more complex "smooth" and "stretched" methods. 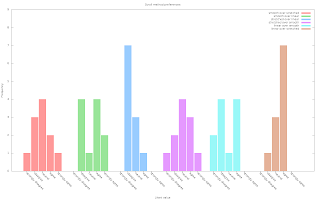 The input data expected by all three methods is in units/ms. Touchpad devices are normalised to 400 dpi, other devices are left as-is. It is impossible to detect in software what resolution a generic mouse supports, so any acceleration method differs between devices. This is intended by the manufacturer, high-resolution devices are sold as "faster" for this reason. As the graph shows, the base profile is roughly identical and the main difference is how quickly the maximum acceleration factor is reached. Central component was a tool built on libinput that displays a full-screen white window, with a round green target. Participants were prompted by GTK dialog boxes on the steps to take next. Otherwise the study was unsupervised and self-guided. The task required participants to click on a round target with a radius of 15, 30 and 45 pixels. Targets were grouped, each "set" consisted of 15 targets of the same size. On a successful click within the target, a new target appeared on one out of 12 possible locations, arranged in a grid of 4x3 with grid points 300 pixels apart. The location of the target was randomly selected but was never on the same location twice in a row. Screenshot of the study tool with the first target (size 45) visible. Each participant was tested for two acceleration methods, each acceleration method had 6 sets of 15 targets (2 sets per target size, order randomised). The two acceleration methods were randomly selected on startup, throughout the study they were simply referred to as "first" and "second" acceleration method with no further detail provided. Acceleration changed after 6 sets (participants were informed about it), and on completion of all 12 sets participants had to fill out a questionnaire and upload the data. A short foray into statistics to help explain the numbers below. This isn't a full statistics course, I'm just aiming to explain the various definitions used below. 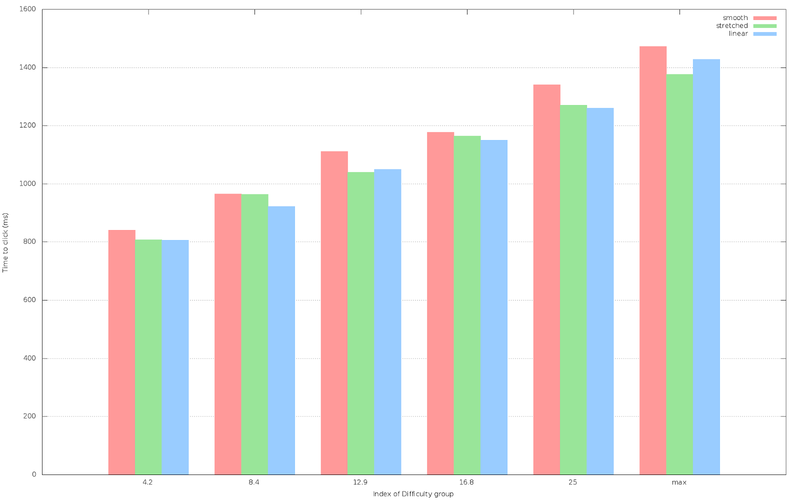 The mean of a dataset is what many people call the average: all values added up divided by the number of values. As a statistical tool, the mean is easy to calculate but is greatly affected by outliers. 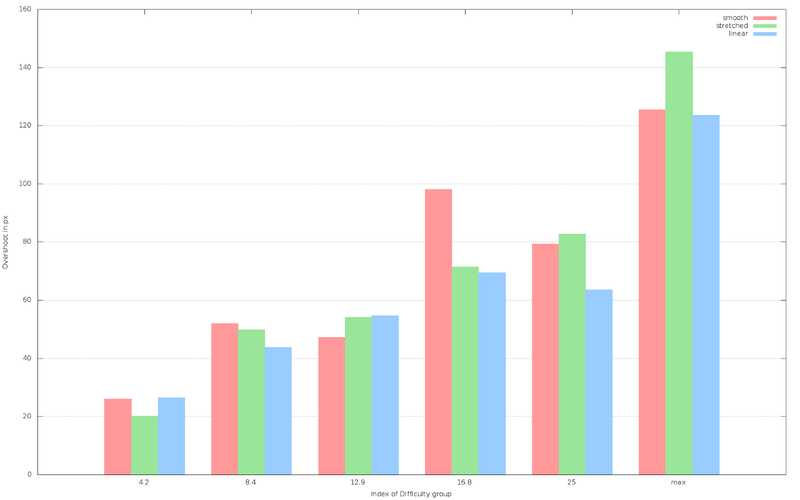 For skewed datasets the median is be more helpful: the middle value of the data array (array[len/2]). The closer the mean and the median are together, the more symmetrical the distribution is. The standard deviation (SD) describes how far the data points spread from the median. The smaller the SD, the closer together are the data points. The SD is also used to estimate causality vs randomly induced sampling errors. Generally, if the difference between two items is more than 2 standard deviations, there's a 95% confidence that this is a true effect, not just randomness (95% certainty is a widely accepted standard in this domain). That 95% directly maps to the p-value you may have seen in other studies. A p-value of less than 0.05 equals a less than 5% chance of random factors causing the data differences. That translates into "statistically significant". The ANOVA method is a standard statistical tool for studies like ours. (we're using one-way ANOVA only here, Wikipedia has an example here). If multiple sets of samples differ in only a single factor (e.g. pointer acceleration method), we start with the so-called Null-Hypothesis of "the factor has no influence, all results are the same on average". Our goal is to reject that hypothesis so we can say that the factor did actually change things. If we cannot reject the Null-Hypothesis, either our factor didn't change anything or the results are caused by random influences. The tools for ANOVA compare the mean value within each sets to the mean value differences across the sets and spit out a p-value. As above, a p-value less than 0.05 means greater than 95% confidence that the Null-Hypothesis can be rejected, i.e. we can say our factor did cause those differences. One peculiarity of ANOVA is that the sample sets have to be the same size. This affects our samples, more see below. An email was sent to three Red Hat-internal lists with a link to the study description. One list was a specific developer list, the other two list were generic lists. As Red Hat employees, participants are expected to be familiar with Linux-based operating systems and the majority is more technical than the average user. The data collected does not make it possible to identify who took part in the study beyond the information provided in the questionnaire. 44 participants submitted results, 7 left-handed, 37 right-handed (no ambidextrous option was provded in the questionnaire). 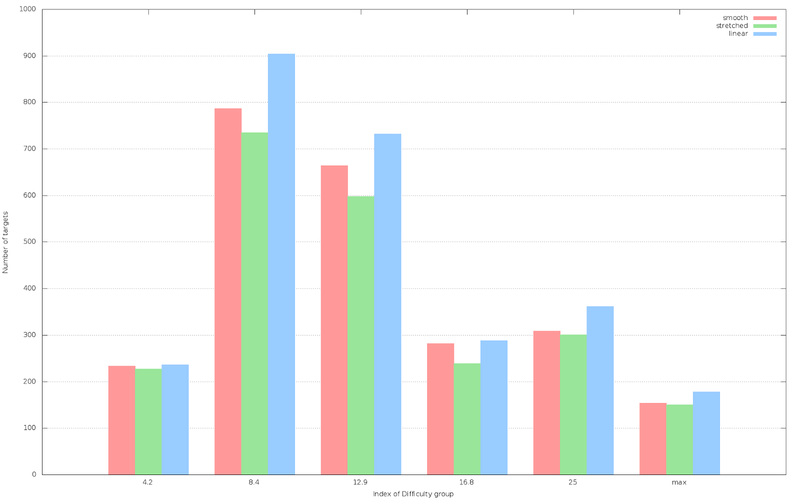 Gender distribution was 38 male, 6 female. Mean age was 33.3 years (SD 6.7) and participants had an mean 21.2 years of experience with mouse-like input devices (SD 4.9) and used those devices an average 58.1 hours per week (SD 20.0). As all participants are familiar with Linux systems and thus exposed to the smooth acceleration method on their workstations, we expect a bias towards the smooth acceleration method. Data was manually checked and verified, three result files were discarded for bugs or as extreme outliers, leaving us with 41 data files. The distribution of methods in these sets was: 27 for smooth, 25 for stretched and 30 for linear. The base measurement was the so-called "Index of Difficulty" (ID), the number obtained by distance-to-target/width-of-target. This index gives an indication on how difficult it is to hit the target; a large target very close is easier to hit than a small target that is some distance away. Illustration of the Index of Difficulty for a target. The top ID was 36.44, corresponding to a 15px radius target 1093 pixels away, the lowest ID was 1.45, corresponding to a 45px radius target 130 pixels away. As said above, ANOVA requires equal-sized sample sets. ANOVA was performed separately between the methods (i.e. smooth vs stretched, then smooth vs linear, then stretched vs linear). 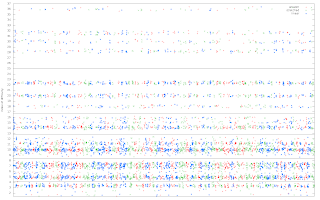 Before each analysis, the two data arrays were cut to be of equal length. 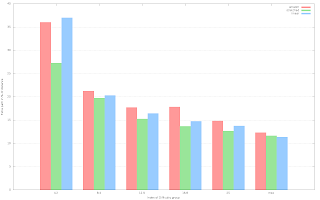 For example, comparing smooth and stretched in the ID max group shortened the smooth dataset to 150 elements. The order of targets was randomised. Time to click on a target was measured as the time between displaying the target and clicking on it. This does not take reaction time into account, but there is no reliable way of measuring reaction time in this setup. In all other combinations, there is no statistically significant difference between the three methods, but overall a slight advantage for the two methods stretched and linear. The most efficient path from the cursor position to the target is a straight line. However, most movements do not follow that straight line for a number of reasons. One of these reasons is basic anatomy - it is really hard to move a mouse in a straight line due to the rotary action of our wrists. Other reasons may be deficiencies in the pointer acceleration method. To measure the efficiency, we calculated the distance to the target (i.e. the straight line) and compared that to all the deltas added up to the total movement. Note that the distance is to the center of the target, whereas the actual movement may be to any point in the target. So for short distances and large targets, there is a chance that a movement may be less than the distance to the target. Straight distance to target vs. movement path shows the efficiency of movement. The efficiency was calculated as movement-path/distance, then normalised to a percent value. A value of 10 thus means the movement path was 10% longer than the straight line to the target centre). In all other combinations, there is no statistically significant difference between the three methods. Somewhat similar to the efficiency of movement, the overshoot is the distance the pointer has moved past the target. It was calculated by drawing a line perpendicular to the direct path from the pointer position to the target's far side. If the pointer moves past this line, the user has overshot the target. The maximum distance between the line and the pointer shows how much the user has overshot the target. 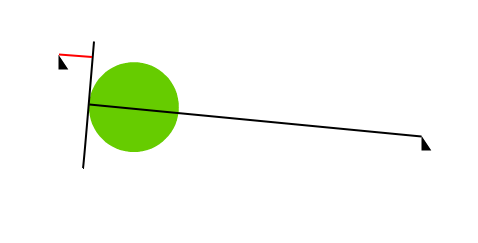 Illustration of pointer overshooting the target. The red line shows the amount the pointer has overshot the target. Overshoot was calculated in pixels, as % of the distance and as % of the actual path taken. Unsurprisingly, the graphs look rather the same so I'll only put one up here. ID 4.2: if measured as percentage of distance, stretched has less overshoot than linear. ID 8.4: if measured as percentage of movement path, linear has less overshoot than smooth. ID 16.8: if measured as percentage of distance, stretched and linear have less overshoot than smooth. ID 16.8: if measured as percentage of distance, linear has less overshoot than smooth. ID 16.8: if measured in pixels, linear has less overshoot than smooth. In summary, there is not a lot of difference between the three methods, though smooth has no significant advantage in any of the measurements. The race between stretched and linear is mostly undecided. The above data was objectively measured. Equally important is the subjective feel of each acceleration method. At the end of the study, the following 14 questions were asked of each participant, with answer ranges in a 5-point Likert scale, ranging from "Strongly Disagree" to "Strongly Agree". The figure below shows that comparatively few "strongly agree" and "strongly disagree" answers were given, hinting that the differences between the methods were small. Looking at statistical significance, the questionnaire didn't really provide anything of value. Not even the question "The two acceleration methods felt different" provided any answers, and the question "The first acceleration method was preferable over the second" was likewise inconclusive. So the summary of the questionnaire is pretty much: on the whole none of the methods stood out as better or worse. Subjective data was inconclusive, but the objective data goes slightly in favour of linear and stretched over the current smooth method. 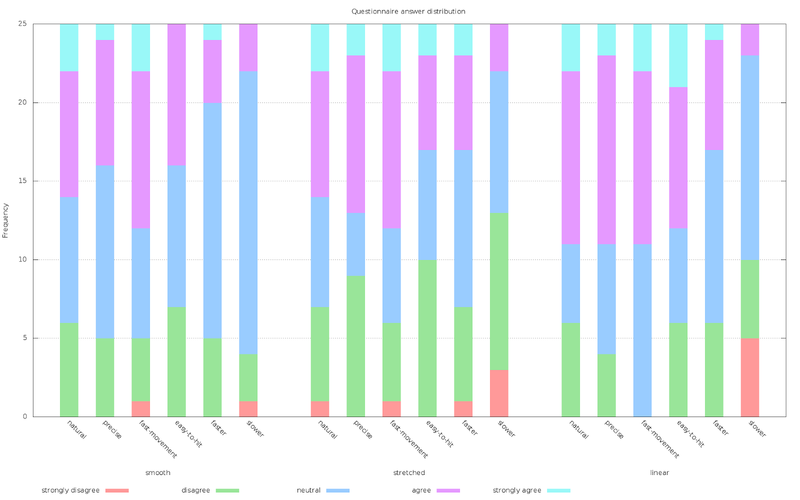 We didn't have enough sample sets to analyse separately for each device type, so from a maintainer's point of view the vote goes to linear. It allows replacing a rather complicated pointer acceleration method with 3 lines of code.